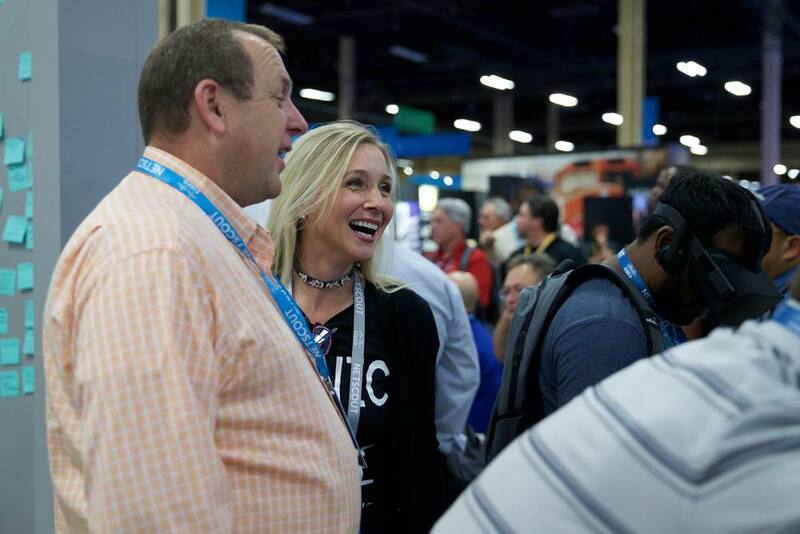 Picture yourself on a trade show floor; it’s loud, confusing, bombastic. Lights buzz, people shout to be heard, your feet ache from miles of trekking across thin-carpeted concrete exhibit halls. Competing messages assault you at every turn and your brain is filled to capacity with statistics and superlatives. You’re done. You’re a mountain, and you won’t be moved. Then a friendly smile and welcoming voice meet you in the aisle, delivering a succinct, simple, easily digestible invitation to learn just one more important thing. And suddenly you’re moving. Into the next booth, into a presentation theatre, ready for more information and potentials. The professional Brand Ambassador is a wonder. One of the hardest and arguably most important positions at any live event, this expert communicator has the power to create connections, improve the visibility and impact of a brand, and benefit every attendee they seamlessly guide toward your solutions and services. Great Brand Ambassadors are hard to find. The best can grow your scans by 100-700% and make guests feel important, empowered, and grateful for their time on your stand. The worst can be ineffectual, impolite to potential customers, and undermine your booth and brand. Only the best Ambassador will do. Assuring your event is staffed by the most qualified, successful Brand Ambassador is easy once you know what to look for and where to find them. Here are some tips. You want and deserve an ambassador who specializes exclusively in trade shows and corporate events. They should promise loads of experience, proven success, and come personally endorse by both the clients they serve and the agency who represents them. Ask questions of your support agency; is the ambassador you’re recommending full or part time? Is he or she primarily a model or actor? Your ambassadors are a first point of contact to attendees and potential clients – they deserve as much analysis as any of your key vendors. Many companies require preferred vendor status when using an agency for support services; by the time that status is achieved you can be confident the ambassadors your agency provides are of highest quality. Until then, ask how your agency hires and screens ambassadors. Ask what qualifications they demand and if they’ll personally vouch for the ambassador’s expertise and performance. If you sense any hesitation, move on. Most agencies in America provide mediocre ambassadors, but the best freelance with most of the top agencies. A little time can net big results. It’s no secret the vast majority of Brand ambassadors are primarily crowd gatherers looking to up their game and their income. And that’s fine; crowd gathering is an incredibly difficult and skilled job, but most are only moderately effective. They’re typically underpaid as an afterthought position, and they generally tend to underperform for their clients. The simple truth is you get what you pay for. Low price typically equals low quality. The best ambassadors are highly specialized experts in their craft and deserve to be compensated accordingly. Fortunately, even those at the top of the market are comparatively inexpensive in relation to your standard personnel budgets but have the ability to generate astonishing returns. Think before you save a few bucks. Going from top tier to mid-tier shaves all of two hundred dollars per day off your bill, pocket change in terms of overall trade show costs. Spending that extra two hundred per day (600-800 total) to assure you get the best in the field can yield a 10x-100x return making strong Brand Ambassador services a no-brainer investment strategy. Once they’re on the show floor, if you discover your ambassador is merely decent, or sense that person is primarily a model or actor “slumming it” in trade shows for a extra money while awaiting their big break, it’s time to question the agency that submitted their services to you. Any agency willing to offer or book any support professional – crowd gatherer, ambassador, spokesperson – that can’t assure you’re getting the very best isn’t worth working with; that agent is more interested in a commission than guaranteeing you get top value for your investment. Once you have the expert Brand ambassador you deserve, work with them to set and manage realistic goals and targets for what you need them to accomplish during the run of the event. If it’s the first time you’ve used a professional in this capacity it’s not impractical to expect them to move mountains, increasing scans and booth attendance by 200-400% or more. If you’ve used ambassador services before, target a reasonable percentage of total event registration, typically 2.5-5%. But stay honest. If your product serves the mass market and you have something new to offer you’ll easily pull those numbers and move lots of mountains. If you’re showing the same solutions and services as last year, or if you provide a specialty capability that targets or serves only 10% of all show attendees, even the best Brand ambassador will struggle to achieve huge lead counts. Give them the tools to succeed and your ambassador will bring the mountain to Muhammed.